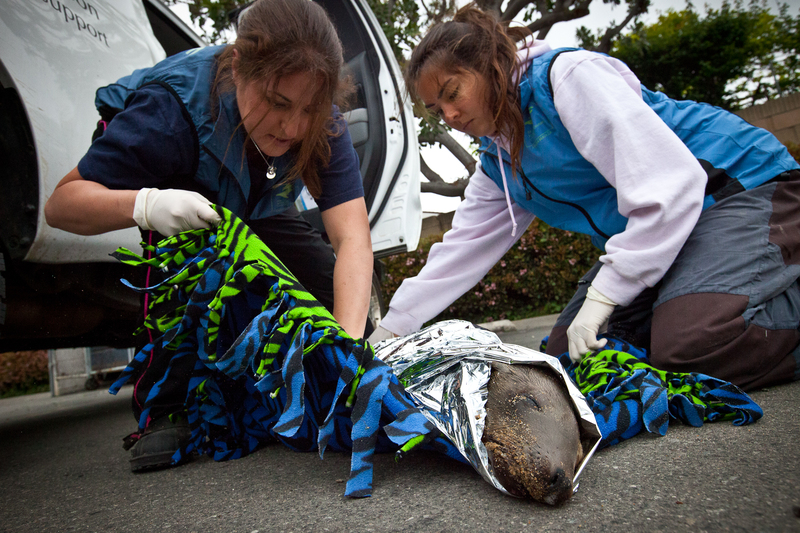 "Wrap him up like a burrito," a Pacific Marine Mammal Rescue Center worker tells volunteer Priscilla Salazar (left) over the phone. "We've brought them back from worse before." In the parking lot of a strip mall featuring a tanning salon, chiropractor and bike shop, volunteers Salazar and Taylor Megginson wrap a hypothermic sea lion pup in an emergency blanket. The pup is barely hanging on to life after a surfer found the pup shivering and stranded on a beach in Southern California. "Can you imagine coming up to put air in your tires, and there's a sea lion in the parking lot?" says Megginson.